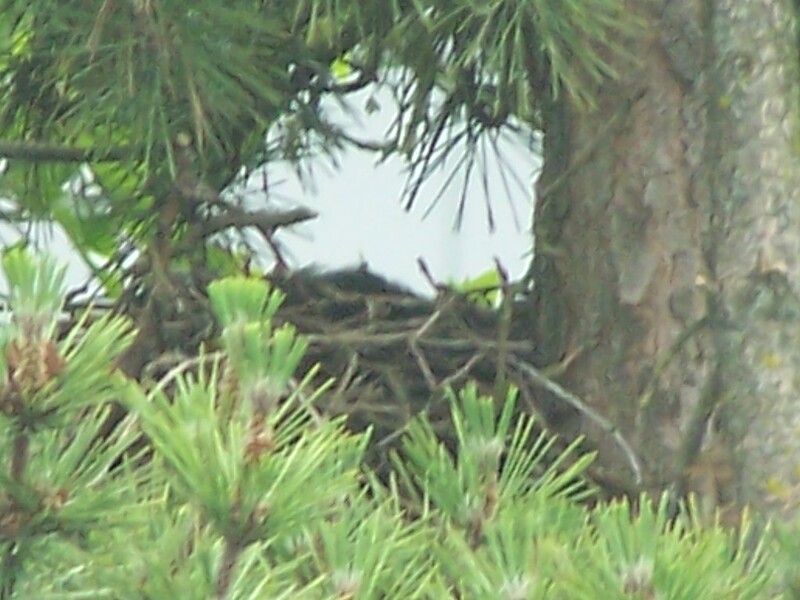 Friday afternoon was sad when I realized that the one baby crow I could see in the Renton nest had died. Mom had come into the nest several times during the afternoon and poked around. The baby was lying over the edge of the nest and she would fluff on him a little too. As the hours went on it became obvious to me that he wasn’t moving and had expired. Close to quitting time the flies were moving in and that sealed the deal. What happened here? We will never really know but I have a few assumptions to give. First thing I missed the prior week of activity since I was on vacation. My colleague here told me she saw them both so I have to assume there were two still then. Last week I never really saw two babies. I question then did one of them fledge? It is possible since I saw what looked like a baby & parent on top of the Ikea sign mid-week. Was that the same family? Remember can we tell them apart? No that is almost impossible. My wishful nature wants to think that one did fledge also because I quit seeing both parents. With no helpers they had to divide & each attend to a little one. Other factors that contributed to this failure was a small family unit. Here in West Seattle the families that are having success are fairly large with several helpers. Now I understand their purpose. They can insure food is found, guard the nest and in general stay on top of an active baby bird who needs constant attention. The Renton family looked like they were just a pair going it alone. Early in the process I saw a helper but after the “killing” he became scarce. Maybe that was him killed in the fight? This nest had some bad juju going on. From that fight about the time they laid eggs to the tree they picked. That tree was a damaged one from the ice storm and we often wondered why that one & not a bushier one a few over. Did that contribute to the sad end? Did our little guy get his head stuck in the side of the nest? Looking at how the mom picked at him and the nest that crossed my mind. If you look at the picture below, you can see why that might be a possibility. Again we probably won’t ever know unless the guys get on a ladder and remove the nest. And the little body is still intact. Odds are against that all happening. Lastly, the utility crew laying fiber optic cable this week. They were about 25 yards away and made a lot of noise. That intrusion probably was the biggest factor to mom not giving the little one enough food and liquid. She must have been put off by all the construction guys walking around her home. Emotionally, this was a tough friday but Mother Nature doesn’t always give us a happy ending. Lessons are learned in life from both the bad and good. One last thought is if all baby crows or birds survived wouldn’t we be knee-deep in bird poop? So, in the end there is a purpose for everything. Say a little pray for our baby crow and he will fly high in bird heaven. Renton Baby Crow lays limp and assumed expired. I thought of you and the foxes. It helped me realize it was sad but not the end. Then Sunday I saw so many who made it.